Before we get all excited about this one win, let's remember that the Bruins were playing the Rangers, who are a bad team this year. I mean, it's not like the Bruins are any better, but still. Patrice Bergeron jumping right up in Vaclav's face like that, attaboy. Stuart getting up and ruining Gaborik's day was pretty good too. And there was a fight. The scoring started late in the second. 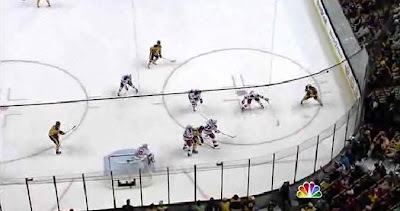 Let's look at what the Rangers defense was doing during the two goals. First goal: As you can see, Ference is over on the left. He's got the puck. That ranger sitting in the middle of nowhere, considering maybe blocking a pass but giving plenty of open space? Vinny Prospal. All Ference has to do it get it across to Miroslav Satan, and for once the cross-crease pass connects. A sigh of relief, for sure. 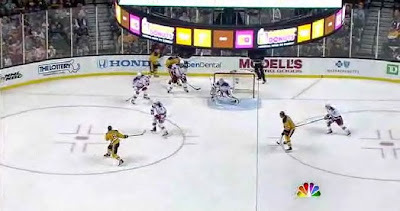 The next period, the Rangers give another gift to the Bruins, leaving Dennis Wideman all alone at the top of the circle. He fumbles the pass, but manages to snipe backhand top shelf on lundqvist, who was probably screened all to hell by Olli Jokinen right there. At least, that's the excuse I'd use if I were Lundqvist. Tuukka gave up a goal with a couple minutes to go, he wasn't happy about it. Overall, I'll take it. Not a great team or against a great opponent, but it makes playoff chances look better and there's nothing wrong with that. I feared for all milk crates when Rask started smashing that stick.